While the mouse was the dominant form of cursor control on a computer for years, it’s not the only option anymore. Laptops include touchpads in lieu of a mouse, and many Windows devices ship with touchscreens as well. If you’re using Windows 10 on a tablet device How Well Does Windows 10 Work on a Tiny Tablet? How Well Does Windows 10 Work on a Tiny Tablet? Windows 10 is taking the devices of disgruntled Windows 8 and curious Windows 7 users by storm. The PC experience is great, but how does it perform on small screens? Matthew tested Windows 10 on... Read More , you can get the best of both methods of control using the new Virtual Touchpad option in the Creators Update. To enable this, right-click any empty space on your Taskbar and click Show touchpad button. Note that if you’re not using a touchscreen, you won’t see this entry. Then, you’ll see a new icon in your System Tray that looks like a little touchpad. Tap on this, and Windows will open a new window with a virtual touchpad. You can drag this around like any other window to get it in a good position. Then, use it just like you would a normal touchpad. Drag your finger around to control the mouse, tap to click, and use all the neat gestures How to Get the Most Out of Your Touchpad in Windows 10 How to Get the Most Out of Your Touchpad in Windows 10 Your Windows 10 laptop touchpad has potential beyond being a poor mouse replacement. We'll show you how to set it up to use smart touch gestures with up to four fingers. Read More to navigate faster. This comes in handy when you want to connect your device to a second display while in tablet mode. If you want to change how the virtual touchpad behaves, you can adjust its options just like a real touchpad. Head to Settings > Devices and click the Touchpad heading on the left. Here you can change the sensitivity of the cursor. Other options might show up depending on your device. This isn’t the most powerful way to control the mouse on your touchscreen device, but it’s still handy to have around! 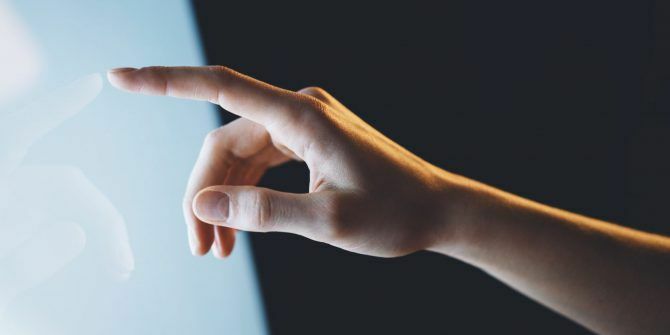 If you often use Windows on a touchscreen, you should also know the best Windows 10 touch gestures 18 Essential Touch Gestures in Windows 10 18 Essential Touch Gestures in Windows 10 Touch gestures are like keyboard shortcuts for your touchpad and touchscreen. And with Windows 10, they have finally become useful! We'll show you how to access the full potential of touch gestures. Read More . Do you use Windows 10 on a touch-enabled device? Let us know if the virtual touchpad comes in handy for you! You can leave a comment below with your input. Explore more about: Windows 10, Windows Tablet, Windows Tricks.